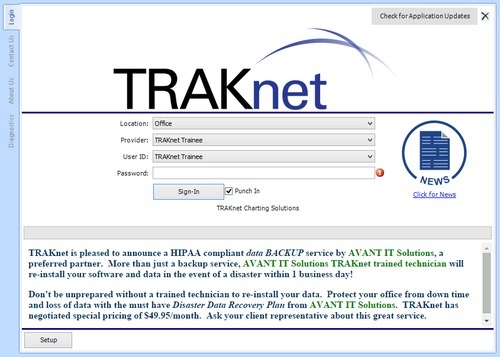 This page will explain how to use the Time Clock Management tool in TRAKnet. 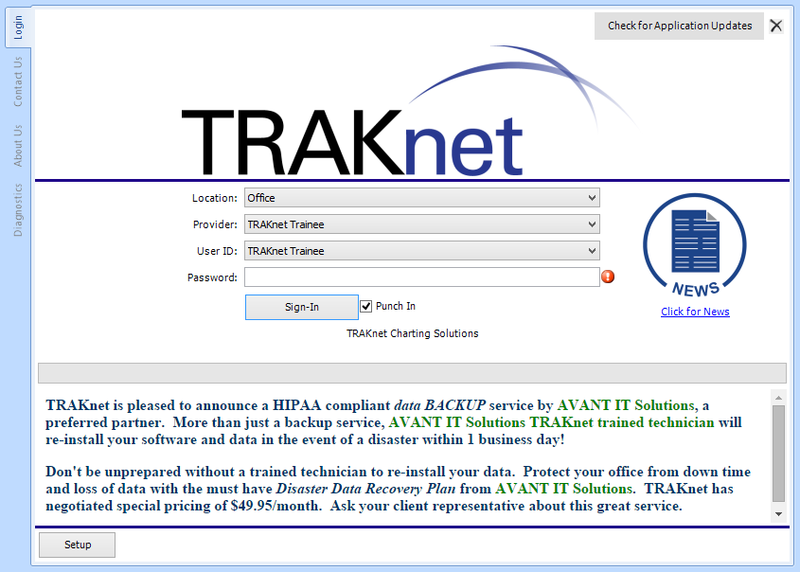 TRAKnet comes with a time clock tool built into the software. Through the time clock tool users can clock in, clock out, and run reports on the time spent clocked in/out in TRAKnet. To clock into the time clock system in TRAKnet, while on the login screen, check the Clock In check box. Upon logging in the user will now be clocked in. To clock out of TRAKnet, select the File drop-down menu in the upper left-hand corner of TRAKnet, then select Punch Out and Exit. This will close TRAKnet while also clocking the user out. To run a report of the clock in and clock out times as well as the duration spent clocked in for all users, click on Tools, Time Clock, Time Clock Management. This will open the time clock management window. Add — Manually enter a new time clock record. Clicking Add allows the user to manually set the user, punch in time and punch out to manually create a time entry. Modify — Modifies a pre-existing time entry. Delete — Deletes a pre-existing time entry. Restore — Restores a deleted time entry. Search — Searches for a time entry based on the criteria entered in the By and Between fields. 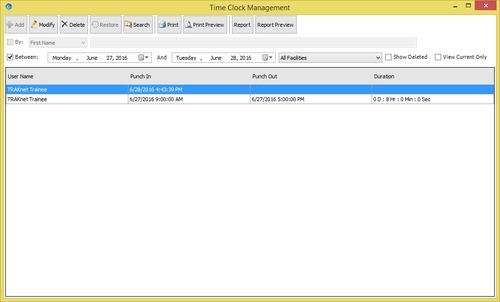 Print — Prints all individual time clock records as displayed in the previous search, does not group an individual user's time together or calculate multiple durations. Print Preview — Generates a print preview of the time records. Report — Prints a more detailed list of time records including running totals on duration. Report Preview — Generates a print preview of the Report. Show Deleted — Checking this box will show deleted time entries. To restore a time entry, click Restore. View Current Only — Checking this box will show only time entries that are current, or actively clocked in. By — Checking this box and entering in specific search criteria will filter the time entry list. Between — Checking this box and entering in a date range will filter the time entry list. Facilities — Filters the time clock report by facility. Using these filters, you can search for a list of time records for the employees in your office. When the search for time records has been completed, click Report to print the time clock report, or Report Preview to see a print preview of the report before printing. Entries without a punch-out time or that are more than 24 hours long are highlighted in red. 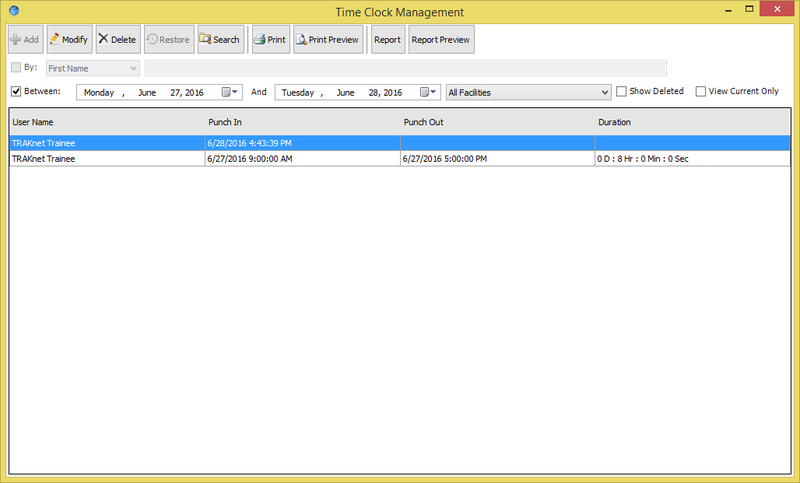 My Time Clock Report allows a user to view their individual time records in TRAKnet without allowing them to add new time records or to view or edit another user's time records. If the user's Time Clock permissions have been removed, they will be unable to access the Time Clock Management screen but will still be able to access My Time Clock Report. Besides disabling the ability to filter by user or to add new time records, it functions the same as the Time Clock Management screen.